Under their Musical Director Siobhán Taylor and their accompanist Derek Dunn, the choir recently held 'A Summer Serenade in the Point' in Warrenpoint Town Hall. Their Guest Artist for the evening, Jason Kernohan accompanied by Jonathan Houston sang a wonderful selection of folk songs: including Isle of Hope, Isle of Tears and appropriately enough encouraging the audience to join with him in The Mountains of Mourne. Siobhán is also the Musical Director of another choir Cantare, who were also invited by Cloughmore to take part in the concert. At separate times each choir demonstrated to the audience how two songs could be sung simultaneously and Cloughmore in the second half of the concert sang three songs, not to their usual tunes but to other familiar tunes. Cloughmore had chosen to support the charity P.I.P.S. 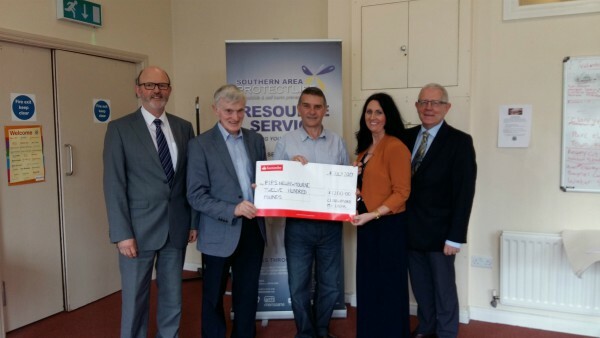 Newry and Mourne and part of the ticket sales and the entire proceeds from the Raffle went to the charity, which were gratefully accepted by their representative Mr. Seamus McCabe who also spoke about the work and activities of the charity. Cloughmore are indebted to the companies and businesses who helped to sponsor the concert or contributed gifts for the raffle: the grand total raised for P.I.P.S. Newry and Mourne was a wonderful £1200. PIPS Newry & Mourne would like to extend its greatful thanks and appreciation to the the organisers and all involved for choosing our charity to benefit, it was truly an amazing evening of delightful song and music.